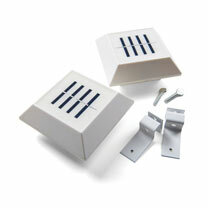 Made from durable plastic, perfect for use on low level guttering. 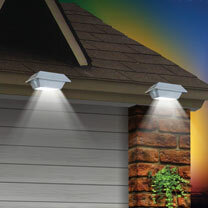 Ideal for garages, porches, conservatories, sheds and fences. Provide welcome bright light from dusk to dawn, simply clip into place and secure with the mounting brackets and screws supplied. Each unit has a built-in polycrystalline solar panel, and is fitted with four bright white LED's and powered by two 1.2V 300mAh Ni-MH rechargeable batteries supplied. On-off switch. Fixings included. Pack of two.12 x 12 x 5cm.